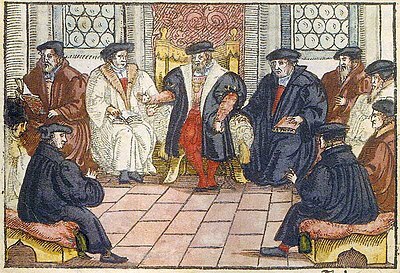 Religious Colloquium of Marburg, anonymous, wood carving, 1557 By invitation of the Landgrave Philipp of Hesse, Luther and Zwingli came to Marburg in September of 1529. They were accompanied by some of their followers, Melanchthon being among these. They were to settle their dispute about communion, but were not successful. Discussion forums are probably the most used platforms for online communication and community development. Car lovers use them, software developers use them, subcultures use them. A discussion forum is primarily a text based mode of communication where someone will post a start to a thread and people will respond to that thread. Often, many threads can be going at the same time, with discussion lasting from a few hours to years in some cases! Google Groups and Yahoo Groups host many discussion forums, with the added feature of sending email to participants. Other forums might not have the email feature, relying on users returning to the forum to post. 1. Locate an example of an online forum and post to your blog a link to the forum with an assessment of the forum based on the list of identifying features we collaboratively developed. 2. Interview a member of the forum you are looking at and obtain comments and ideas on how the forum might benefit from facilitation services - such as a coordinated event to help focus people around a particular issue, or the writing of a summary to close a thread in the forum. 3. Join this course's email forum and post an email with a link to your blog post containing your write up and interview. Communication Dynamics: Discussion Boards, Weblogs, Wikis Recording made of James Farmer´s presentation on January 24th 2005 for the Tesol Electronic Village Online Weblogging Session moderated by Barbara Dieu, Aaron Campbell and Graham Stanley. the meeting recording from the last course where we discussed this and the next topic. This page was last edited on 27 July 2016, at 08:31.